Being traveler is not easy at all. I have already shared “My experience of immigration scam in the USA” which left me scared. The traveling involves courage, money, and fear as well. Things don’t work out always the way you wanted. Hence, today I am sharing two money savvy products to use during your trip. Being a traveler I always look to save money and invest in the things which give me most out of it. I always look for multi-purpose products which are feather weighted and easy to carry. I prefer buying things which I can carry in my backpack or carry on. Today I am sharing two of my favorite products which I love to use. Most important thing while you travel is to take care of your money and phone. 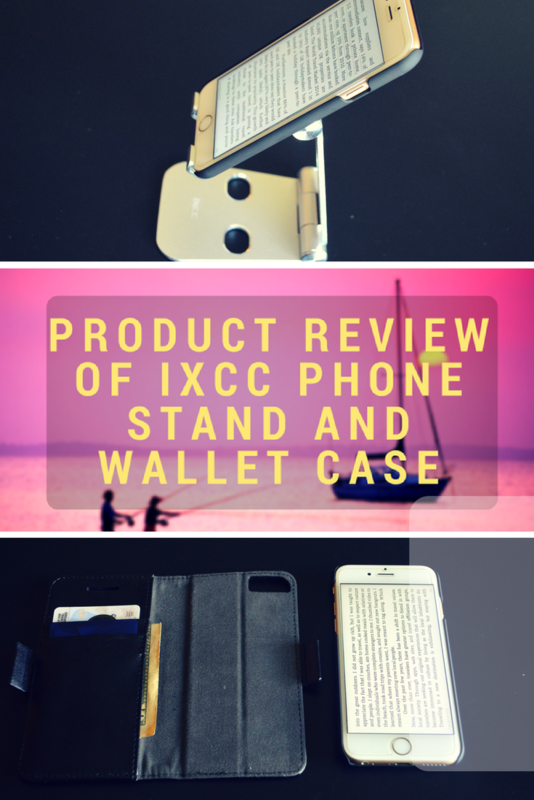 Hence I am sharing “product review of iXCC phone stand and wallet case”. These two products are perfect to keep your trip safe and pain-free. As I travel a lot through the flight I spend time reading an ebook on my phone and iPad or watch movies sometimes. When I travel to my home country it’s 15-hour flight and holding the phone in my hand can cause pain for sure. Isn’t it great if you get phone stand which stays at a place? You can relax and watch anything on your phone and iPad. The iXCC innovative phone stand is literally a perfect stand someone can ask for. It is fully foldable so you can fold the stand and even carry in your purse or backpack. The best thing about this foldable stand is it can hold iPhone, iPad, Samsung tab even Kindle as well. These phone stand can be used for almost all major smartphones. All in one stand with multi-angle adjustment so you can adjust accordingly. The anti-slip pad and feet work perfectly to keep my devices in place while in use. If your kids have a habit to use phones and tablets then place them on the stand and keep little far so you can save their eyes too. I loved this wallet purse case because I don’t have to carry my purse all the time while I travel. It has three slots to keep my cards and cash. I can keep my ID, credit cards, and debit cards at one place. Besides card slots it comes with magnetic phone cover means you are getting phone cover for free with this wallet case. This case is detachable and shock absorbent. This case is made up of microfiber PU synthetic leather. It is artificial leather but looks and performance are amazing. This cover also works as a horizontal and vertical stand which serves a hand’s free purpose during video calls, watching movies etc. You can choose your color according to your style but black is personally my favorite. iXCC provides numerous products like charging cables, power bank, phone case, car charger and much more. Check out all products of iXCC . This is really cool! I hate carrying around a bunch of extra stuff, so having a wallet built into the case is awesome! Yes and that case comes with a magnet so you can even detach it. Ultimate 2 in 1 combo. This is an awesome case! It would be awesome to have my phone stand up when I am watching videos or reading. I use it all the time when I read e-books on my phone or tablet. I carry around way too much stuff! Cutting out a wallet and having this combination would be perfect! I can understand. Sometimes I just get tired with my purse. This is perfect to get rid of extra stuff. I can see myself using this product. It would be perfect for when I use the phone in the bed before I go to sleep. Yes, it is. Hope you liked it.